Ten new members are joining the Basketball Hall of Fame. The 2014 Hall of Fame class is headlined by former NBA All-Stars Mitch Richmond and Alonzo Mourning. Previous NBA commissioner David Stern also joins the lineup, as does esteemed coaches Gary Williams, Nolan Richardson and Bob Leonard. Nat Clifton, Sarunas Marciulionis and Guy Rodgers round out the list of new inductees. The Immaculata University women's team from 1972 to 1974 is also on the list based on their three straight AIAW National Championships. The official enshrinement ceremonies take place on August 8. Although the 2014 class does not feature a superstar player, the quality is solid and there is a good mix of options represented. From a collecting perspective, this means that values will likely remain reasonable and it presents a possible budget option for acquiring cards for Hall of Fame players and coaches. It also means that interest in the inductees will increase and likely lead to their inclusion in more products in the future. In regards to the actual process for entering the Basketball Hall of Fame, Mitch Richmond, Alonzo Mourning, Nolan Richardson, Gary Williams and the Immaculata University team were nominated for enshrinement, advanced through the Screening Committee, and inducted by the Honors Committee. To be inducted, finalists must receive 18 out of 24 votes from the Honors Committee. The remainder of the Basketball Hall of Fame inductees were decided by various direct-elect committees, each tasked with specific areas of history from the game of basketball. In the list below, we take a brief look at each player honored, including rookie cards and other card offerings. 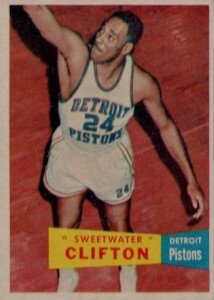 Nat "Sweetwater" Clifton was the second African American to play in the NBA, spending seven seasons with the New York Knicks and his final NBA season with the Detroit Pistons. He was named an NBA All-Star in 1957. Clifton's rookie card is found in 1957-58 Topps. This is also the only card from his active playing days. Nat Clifton passed away in 1990. Nicknamed "Slick," Bob Leonard is the winningest coach in ABA history, leading the Indiana Pacers to three titles. He also remained the coach for several years after Indiana joined the NBA during the ABA-NBA merger in 1976. 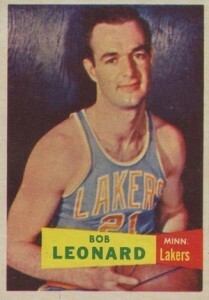 Like many coaches, Leonard got his start in basketball as a player. One of his most memorable moments was sinking the winning free throws for Indiana University in the 1953 NCAA championship game. He was selected in the 1954 NBA Draft and spent several seasons in the league with the Minneapolis/Los Angeles Lakers and the Chicago Packers/Zephyrs. His rookie card appears in 1957-58 Topps. Born in Lithuania, Šarūnas Marčiulionis was the first Soviet player to to play in the NBA, suiting-up for Golden State, Seattle, Sacramento and Denver. He began his career with BC Statyba in the USSR League and won gold in the 1988 Summer Olympics with the Soviet Union. Marčiulionis also played for the Lithuanian National Basketball Team. He was named the Lithuanian Sportsman of the Year four times, EuroBasket MVP in 1995, and was included on the list of FIBA's 50 Greatest Players in 1991. 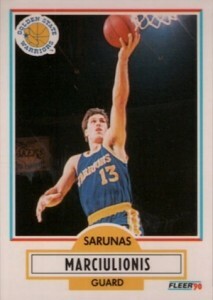 Šarūnas Marčiulionis has three rookie cards available in 1990-91 NBA products. Arguably the biggest name in the 2014 Hall of Fame class, Alonzo Mourning was a defensive force. 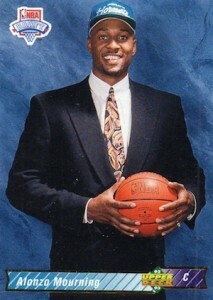 Mourning was the second overall pick in the 1992 NBA Draft after a stellar career at Georgetown University. During his 15-year career, "Zo" played for the Charlotte Hornets and New Jersey Nets, but is most remembered for his time with the Miami Heat. The seven-time NBA All-Star won a title with the Heat in 2006 and was the NBA Defensive Player of the Year in 1999 and 2000. Mourning has seven rookie cards available in 1992-93 NBA products. An accomplished college coach, Nolan Richardson won an NCAA title in 1994 with Arkansas and led the team to three Final Four appearances. He is also the only head coach to win a Division 1 title, an NIT championship and a Junior College National Championship. 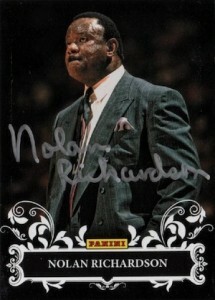 Nolan Richardson cards are mostly limited team releases from Arkansas, but a signed card was included in the 2014 Panini Father's Day promo set. The other big name from this HOF class, Mitch Richmond is best known for his scoring ability. After finishing his collegiate career at Kansas State, Richmond was taken fifth overall pick by Golden State in the 1988 NBA Draft. He was named the 1989 Rookie of the year and would later play for Sacramento, Washington and the Los Angeles Lakers. The six-time All-Star won the 2002 title with the Lakers in his final season. Richmond also played for the U.S. Men's National Team, winning a gold medal in the 1996 Summer Olympics. 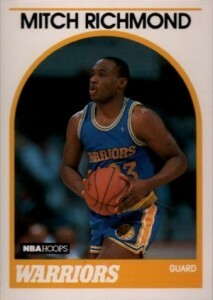 Mitch Richmond has two rookie cards that can be found in 1989-90 NBA products. 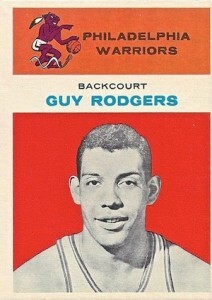 A strong player early in the NBA's existence, Guy Rodgers played for the Philadelphia/San Francisco Warriors, Chicago Bulls, Cincinnati Royals and Milwaukee Bucks during his 12-year career. The four-time All-Star was an excellent facilitator, leading the league in assists twice. Rodgers was selected as a territorial pick by Philadelphia in 1958 based on his college career at Temple. His rookie card was released in 1961-62 Fleer. Guy Rodgers passed away in 2001. Although his career was marked by several controversies, the former commissioner oversaw the NBA's incredible growth that eventually led to it becoming one of the biggest professional leagues in the world. After 30 years as the NBA Commissioner, Stern retired in 2014 and handed over the reins to Adam Silver. Somewhat surprisingly, David Stern does not appear to have any cards that are specifically his. 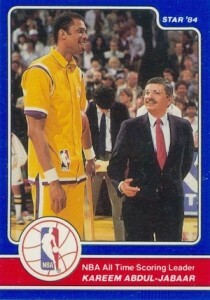 His earliest card appearance is on a special 1984 Star Company release honoring Kareem Abdul-Jabbar. 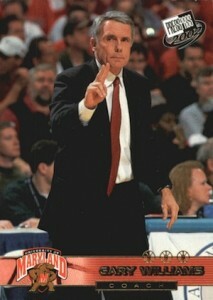 The face of Maryland basketball for over two decades, Gary Williams led the team to 11 consecutive NCAA tournament appearances and a 2002 title. The storied coach was also inducted in the College Basketball Hall of Fame in 2014. There are not too many options for card collectors, but Williams has been included in several products from Press Pass and Upper Deck.